I have lots of Indian vegetables stocked in my fridge after my last week's Indian grocery shop visit. I had murungakai (drumsticks), podalangai(padval), kovakkai(tindora) and fresh coconut. 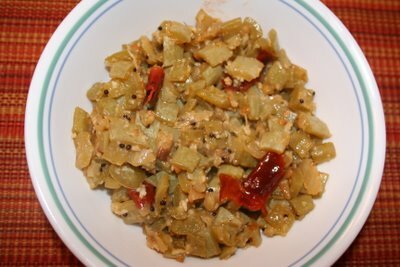 So decided to make some very Indian (specifically Tamilian) dishes with those vegetables for dinner last night. 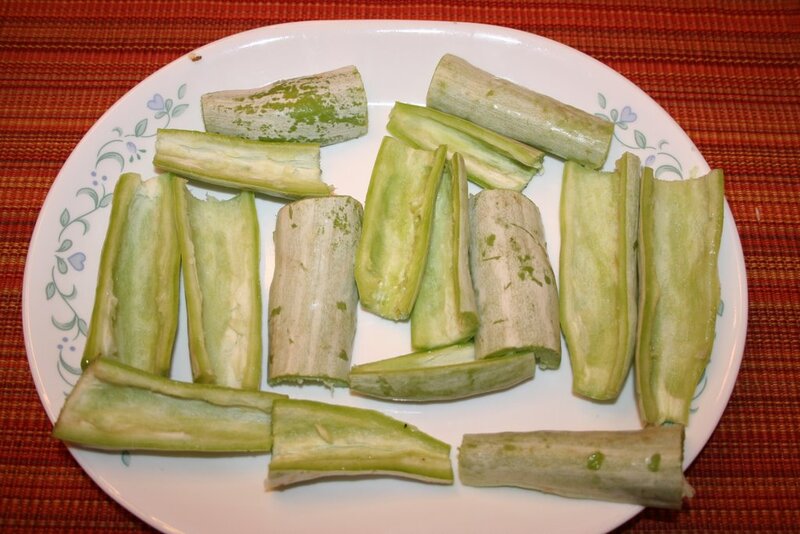 When I think of drumsticks the first thing that comes to my mind is Sambar. 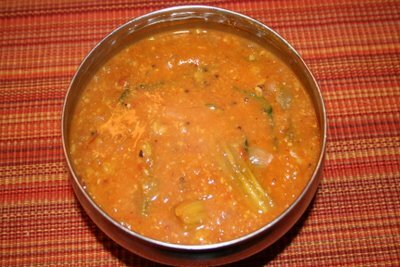 I was bored of making the regular sambar and hence decided to go with arachu vitta sambar. 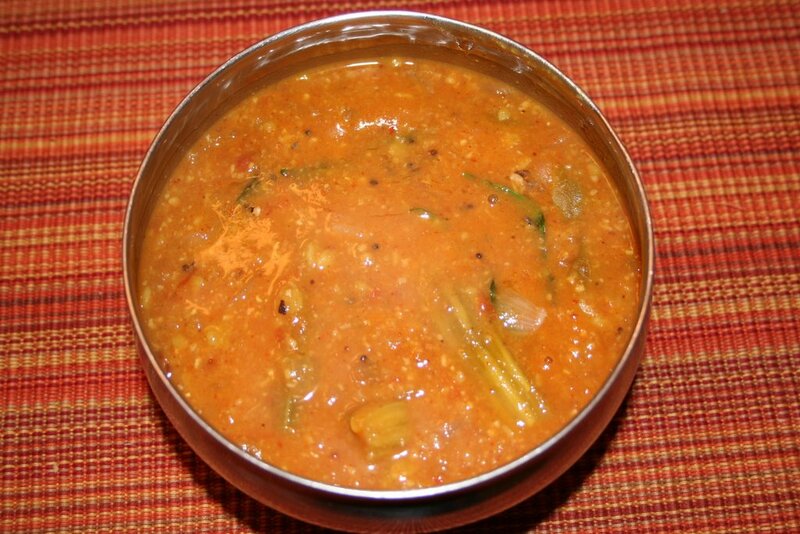 The main ingredient in this type of sambar is the freshly ground masala and it adds a very unique and different taste. Then decided to do something spicy and dry to go with it and hence a varuval. With the fresh coconut I decided to do some poriyal. So the final menu was arachu vitta murungakkai (drumsticks) sambar, kovakkai (tindora) (ivy gourd) varuval and podalangai (padval) (snake gourd) poriyal. Fry the dry ingredients in a pan, adding a tsp of oil and till the coconut becomes a little dry. Let it cool and then dry grind to a powder. Cook drumstick with a pinch of turmeric, with enough water. Heat oil in a pan and add chopped onions. Fry till the onions turn brown and then add tomatoes. Once the tomatoes turn mushy add the ground powder and the other powder ingredients. Add cooked drumsticks, dal and the tamarind extract. Add two cups of water and let it cook for 15-20 min on medium heat. 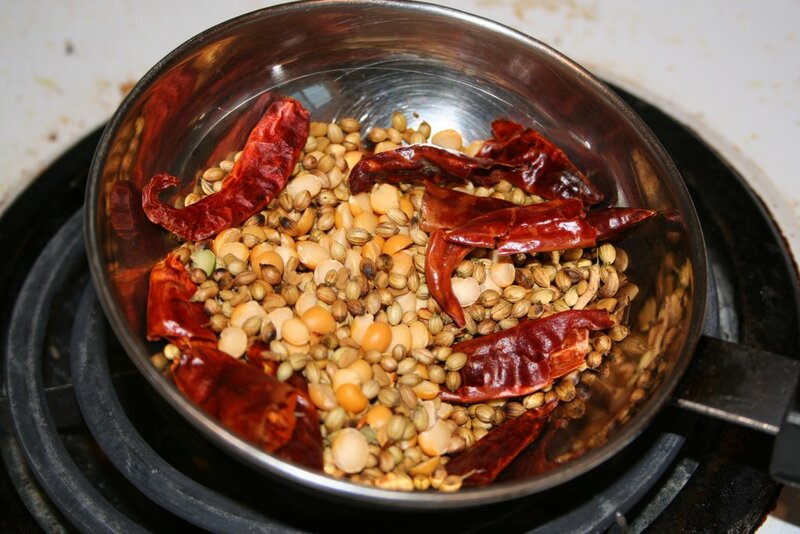 Heat oil in another pan, add seasoning ingredients and once the mustard starts to splutter add to the sambar mixture. Turn off the heat and serve with rice. Heat oil in a pan and then add the seasoning ingredients. Once the mustard seeds start to splutter add the onion and garlic. Fry the onions till they turn golden brown and then add the chopped kovakkai. 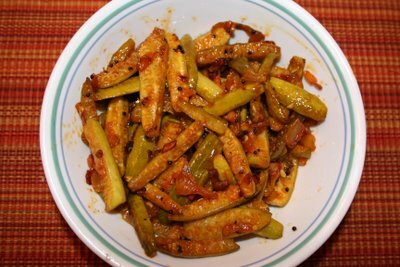 Add the powder ingredients and simmer and fry till the kovakkai turns a little crispy and dry. Heat oil in a pan and then add the seasoning ingredients. Once the mustard seeds start to splutter add the chopped onion. 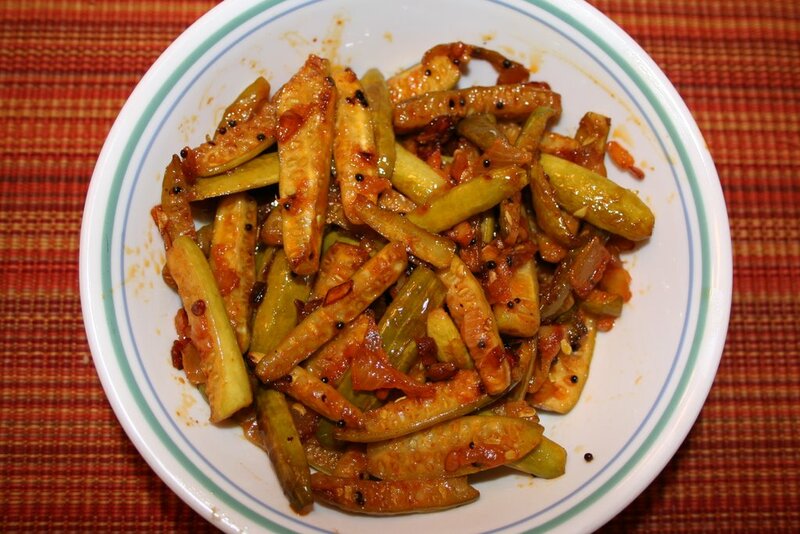 Fry the onions till they turn golden brown and then add the chopped podalangai. Add salt, pour one cup of water and let it cook for 15 min till the podalangai is cooked. Finally add shredded coconut and turn off the heat. I came across your blog by chance. Looks like you've just started blogging. I must say, you are doing an amazing job. Your pictures are very good and your recipes list every ingredient and methodology in detail. I have bookmarked your blog and will definitely visit it often. Keep up the good work. Thanks for the compliment. Yes I jus started blogging and will try to update as often as possible. Pls do revisit and leave suggestions/comments. hey..u know what.. Abi told me abt this blog spot. I love the pics..very very inviting..and you have really done a good amount of experimenting..
Yeah I accept..you should cook what you want..
thanks anandhi. leave me ure suggestions whenever u hav time. 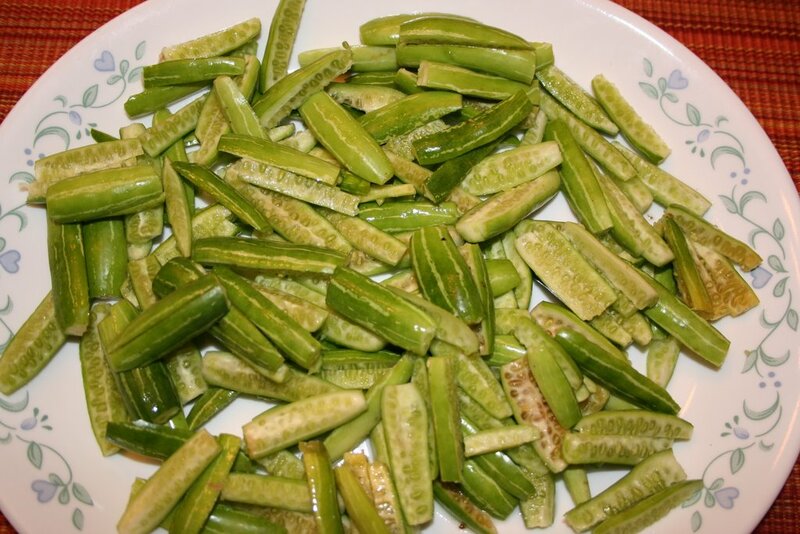 Hi Deepa, bumped into your blog looking for traditional madras kovakkai poriyal. Your recipes are easy to follow and certainly authentic. Keep up the good work. Thanks JV. Do check often. Thank you for your delicious recipe. I tried it out and I must say I was pleased with myself. It was delicious. Thanks for sharing! I am spinster,who stay alone an don hv much ideas abt cooking,my job was study eat,work n sleep.As fillings alwayz rice curd,egg,bread, and Noodles..i really love my mums arachvita sambar.Im in banglore and mum in Tamil Nadu.. i tried it.. and my feoncy was shocked to see me cooking.. gradually m learning and its quite intrusting.. i am working in night shift. suggest me some yummy dishes that i can cook fast for lunch.. bcoz i sleep till 2 pm in the noon. and thanks for ur blog.. It really helped me a lot. In other word u have offered food for unknown in some corner of world. Hope u came to knw y i mentioned Dee(sis) now... Take care!! Today I came across your blog.. seems to be very simple and useful.. great jos.. keep on move.. I m recently married and i want a good blog to improve my cooking, thus i found out with tamilnadu style cooking. Keep up the best work. Your post are all good.